We work SO. HARD. We comment on others’ posts. We reply to our own comments. We interact with other bloggers. * We even have to carve out time to write our own posts!! We work hard to create quality content, make sure it’s presentable, and grow our own audience as well as ensuring we appreciate other bloggers as well. It’s tough. Blogging takes so much time!! I don’t know how long it takes other bloggers to write & format a post, but it probably takes me at least 2 hours?? 3??? I have no idea. It just takes me SOOOO MUCH TIIIIME to write just one post and make it presentable, which takes out precious time in my week that I could be doing for other things!!! Sometimes we doubt ourselves. And by sometimes… I mean A LOT. I have friends who are going through blogging slumps/slumpy moods and being doubtful of themselves, and I face the same thing!! EVERY blogger faces those doubts. But sometimes we worry so much and we twist it way out of proportions. So it’s important to support & appreciate bloggers to know that, no, our doubts are not TRUE!! We use our voice. And this is probably the most important one out of this whole list. Because bloggers, with a platform to write on and talk about whatever they want, can use their voice to speak up and stand up for things they believe in. Especially in book blogging! Book bloggers have called for more diversity and representation in YA books, and we are slowly working towards more and more diverse books. Our voices have such a large impact, no matter how small we may think we are. *Or… these are things that we SHOULD be doing. Obviously, this is the number one way to support bloggers. Comments and every single interaction (except for the bad ones, of course) mean SO MUCH to us, and it truly is one of the best ways to support us!! There are so many people who are THE SWEETEST. and THE KINDEST. Like when I’d taken a week off of posting because of anxiety & panic attacks, y’all were literally SO KIND and all like “we support you May!! Take breaks when you need it! I’m here if you ever need me! !” All that literally means the world to me. And a lot of times, when I’m feeling like “uuugghhh I don’t want to blog” or “I feel so dead about everything” or even “this is so pointless why am I doing this”, I read blog comments where people say the simplest things like “I love your blog! !” and “omg you made me laugh out loud!”, IT CHEERS ME UP. Instantly. Maybe not forever, but in that moment, it makes me so happy. Ghost followers are nice because they increase your follower count, so THANK YOU to ALL my followers, you are awesome!! But you know. Interaction. I like talking to you. Because then it means I’m not just talking to myself (which I actually do a lot more than is probably healthy). BUT STILL!! Any amount of support is support, and I’ll gladly take it all. *It’s very unlikely that someone will take the place of a mango but… you can try. I loooooove promoting my favorite blogs, or blogs I think deserve more love. So make sure to do that too! And like, if a blogger was looking for a specific type of blog, ie. a book blog that talks about a lot of mangoes, you could recommend they check out MY blog. Because you love me. Oh! And I know that some blogs have design services, or editing services, or beta-reading services, or sensitivity reading services—recommend those too! Especially sensitivity reading, since it’s so very important to make sure that writers are representing marginalized folks in the right way. 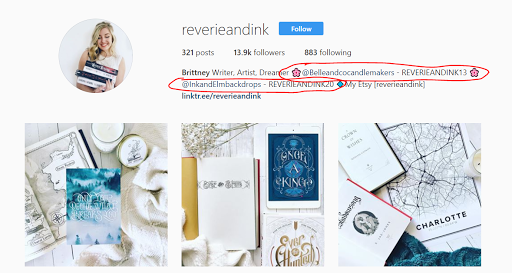 A lot of bloggers have little affiliate links—so when you use that specific link to buy things, that blogger gets a tiny commission. 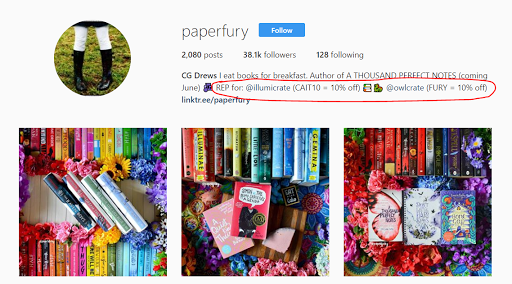 I know that some bloggers are Amazon affiliates, and others are Book Depository affiliates, etc.! It’s literally something so small to do but helps HUGELY. And I’m not sure if representatives for certain products (like book subscription boxes) get any commissions?? But if I were a rep, an example code for me might be MANGOES10 for a certain product, and when using that code, you’d get 10% off the actual cost. SO USE THOSE!!! YOU SAVE MONEY!!!! YOU MAYBE BENEFIT THE BLOGGER!!! Here are some examples if you don’t know what these are. Also I just chose random accounts I’ve visited before and remember seeing rep codes for NO FAVORITISM OR ANYTHING. And of course, some bloggers actually have their own stores where they create or design things and SELL them. (A lot of times they’re on Redbubble, Society6, or Etsy.) I know not everyone has the money (I know I don’t) but when you can, BUY THINGS FROM THOSE BLOGGERS!! It really helps them and often, their creations are quite nice. I find this ESPECIALLY important in the book blogging world, but honestly, it’s just as important in other aspects of the blogging world as well?? I think what really hits me the most with this one is that we as bloggers have a voice. We ALL have voices. But some voices aren’t heard as much as others’, or they aren’t able to speak up like others. And these people are often people who belong in minorities or marginalized groups!! They are so important. I know that Western society (idk about others) have smothered voices of so many groups of people, and that’s obviously not right. So take the time to make sure those people are heard, because often times, they HAVE NOT been heard! Stick up for bloggers. Help them around if they’re new. Offer positive words if they’re feeling down. Defend them when they need to be defended. Listen to them if they need to rant. Rant with them. Joke with them. TALK WITH THEM!!! GIVE THEM MORAL & EMOTIONAL SUPPORT!! GIVE ADVICE WHEN NEEDED! LOVE THEM! HUG THEM! GIVE THEM MANGOES!!! Any form of support means SO MUCH to bloggers. I know, because I AM a blogger. What you do may seem tiny, but it can mean a lot. So just !! appreciate and support bloggers!!! Because everyone deserves appreciation and support and validation and mangoes. what other reasons do we need to appreciate & support bloggers?? how else can we do that??? are you having a good Valentine’s Day? anyone giving me mangoes? and ooh, support a few of your fellow bloggers in the comments below and link me to some of your favorite bloggers or posts!!! I’m a blogger too (well. duh.) and I CAN’T APPRECIATE THIS POST ENOUGH!!!!! You go girl! Never stop blogging! Love the idea of this post! I also already read Maries post and then saw this one and I have to say I am loving all the love! I think its SO important to comment on other blogs– especially ones that make an impact on you or that you connect with as a reader and as a person! I try to comment on other blogs regularly and as a new blogger I know how good it makes you feel to see people comments and reading your blog content. Great post!! What a great post! I’m just starting out with this whole blogging thing, but already people have been so friendly and encouraging, which makes it feel much easier! There’s nothing like getting comments and likes on a post to make you feel like the work you put in was worth it. Amazing post!! I’ve just started my blog and it is indeed a hard work, but I do what I love, so there are no regrets! I agree with everything you say in this so much!! I’m pretty new to the book blogging community, but every single interaction means so much!! THANK YOU FOR MAKING THIS POST!! THANK YOU!! And, yes, I love having conversations and it means so much to me that someone takes the time to reply to my thoughts! I did a post recently where I asked people to send me their blog posts that they are incredibly proud of and made a little post about it. People really liked it and it made my heart happy to help people boost their posts. I love your blog very much, May! It’s so pretty and the content you put it is truly amazing. Keep up the excellent work! Wonderful post! I totally agree, when I am going through a blogging slump, seeing other people’s comments on my posts is really motivating. I became a blogger to share my love of books, and it’s so important to support each other and share the bookish love with other bloggers! Great post! I think the thing I struggle with is interacting. I’m so busy these days and it takes so much time, but when you carve an hour out, it’s not that bad. I AGREE SO MUCH WITH THIS POST. BLOGGERS = NEEED SUPPORT. Blogging gets SUPER stressful sometimes because we are creatures that love to stress about things that may need just a teeny amount of stress, and then we just stress overtime and FLAIL TIL WE DROP and people don’t discuss this??? PEOPLE DONT TALK ABOUT HOW HARD IT IS TO ACTUALLY DO THIS. And we’re trying to, write posts, make them look nice, make them funny, then find images, then respond to comments, then read others’ posts, and then interact, and fit this all around other stuff going on in outlives like eating mangoes or cake or idk… sleeping? and it really can build up and SUPPORT is needed and rkjsgbjkgj VIRTUAL HUGS NEED TO BE SENT SO WE FEEL SMOL AND APPRECIATED AND EVENT THE SMALLEST LITTLE GESTURES LIKE A SMOL CUTE TWEET OR IDK SOMETHING CUTE CAN MAKE US SO HAPPY AND FEEL A LITTLE BETTER AND LIKE THE ENTIRE INTERNET IS IN FACT *NOT* RESTING ON OUT PUNY SHOULDERS. Yes exactly!! I feel like a lot of non-bloggers look down on bloggers… but they work so hard and get so stressed about blogging??? Yeah no one really talks about how hard it is to blog (which is one reason why I think no one really appreciates bloggers). But omg yes like there are so many things bloggers have to do (or should do…) PLUS all the other life-y things and it’s incredibly stressful ugh. BUT YEAH SENDING ONE LITTLE BIT OF SUPPORT MEANS THE WORLD WHEN YOU’RE STRESSED!! awww love this! it’s always great to feel appreciated as a blogger and i think you covered all of it nicely! YES! Do all this! Definitely! I always share my favorite posts of the month in my wrapup and lately the list has become enormous, because there are SO many amazing posts 😀 What I want to get better at is using other bloggers affiliate links! Agh I love this post so much! (…says every comment I leave on your blog ever, but let’s pretend I am more creative.😂) YES YES YES for blogger appreciation!! One of the best parts about being a blogger for me is actually giving appreciation to other bloggers. Because the community is just so wonderful, and there are so many ways to give back. Thank you for writing this, May! This was such an uplifting post! I love supporting other bloggers and this was such a fantastic post! I love you more. 💞💞 I hope your recent read has been good to you! !